A message from Co-Founder "Puncher Villa"
It was 2009. I had just relocated back to Las Cruces after an eight year escapade in the great city of Austin, TX. During my time in Texas, I was introduced to the wild world of roller derby. It was not an endeavor I ever considered taking part in myself, but even being a part of the audience during the resurgence was invigorating. 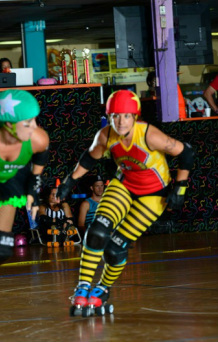 A nasty divorce, a cliche period of trying to "find my identity," and rumor of an underground roller derby league in El Paso, Texas proved to be the perfect storm for a new beginning. Thoughts were brewing. A fellow teacher that I barely knew began a conversation with me one day that changed everything. She stuck her head out of her classroom door and said, "You ever heard about roller derby?" I responded with an enormous smile, "Banked track or flat track?" She grinned, "I have no idea what you're talking about but we need to talk." We began dreaming of a day we could join the ranks of the fierce, athletic women who defined the derby revolution. Somehow ideas turned to plans and I knew my best friend was just the crazy addition we needed if this nutty idea was going to become a reality. Just like that, the Unholy Trinity was born. Seemingly normal women with regular daytime jobs became Hippie Check, The Venomous DiMilo, and Puncher Villa. Crossroads City Derby was established in the back room of a tiny brewery, and to our surprise, there were other women willing to join us on the quest for empowerment, adrenaline, fitness, and new opportunities. Together we built an organization that welcomed others in search of a better self. In doing so, we became better versions of ourselves, too. CCD has since evolved into a non-profit organization supporting the Las Cruces community. I'm proud to say CCD is a WFTDA apprentice league* filled with highly competitive athletes who represent not only our city, but the wonderful wild world of roller derby. Though the Unholy Trinity has disbanded, the future of the league is bright as new recruits train, new leadership evolves, and exciting opportunities develop. I am proud to be a founding member of this growing organization. At the most unexpected time, and in the most unexpected way... roller derby saved my soul. *Crossroads City Derby became a WFTDA Full Member League in July 2014.